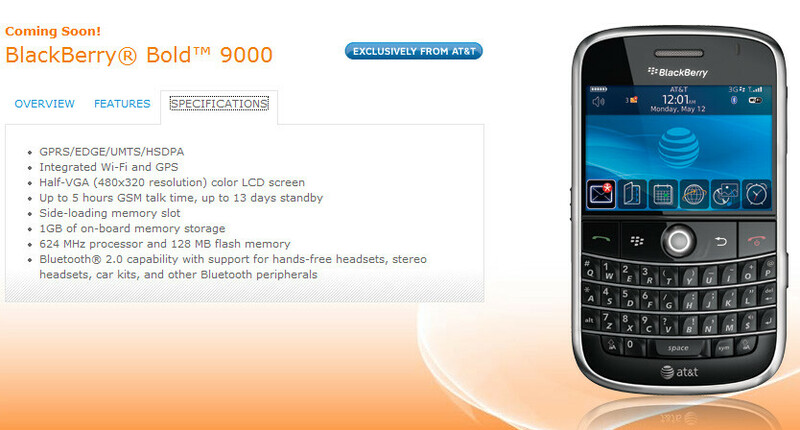 AT&T now lists the BlackBerry Bold 9000 as “coming soon” and proudly notes that it will be “exclusively from AT&T”. We’ve heard about that right after the Bold’s announcement, but it is just now that AT&T claims it. Although the carrier doesn’t really give any details, the previous information stated that it will be “exclusively” just until the other versions (CDMA and one for T-Mobile) are ready to launch with the rest of the carriers. Bold 9000 will be the first BlackBerry with OS4.6, which improves the interface to be more user-friendly. It has a high-res half-VGA (480x320) pixels display, fast processor, global GSM/3G support and a full QWERTY. Business cat is not impressed. I'd like if they'd hurry up and finally release it. If they wait any dang longer to release it, the BB Thunder will steal all of it's ......errr Thunder? lol. The Thunder is only looking 6months if that out right now. So I'm not sure if it's going to hurt the sales or not. My guess would be not, just because the Thunder is going to have a long 9 month exclusive with VZW. I seriously doubt Thunder will steal anything from anyone. None of Verizons touch screen phones have managed to do stellar. Voyager had a lot of hype at the beginning, but shortly after release it because a forgettable device. They will release a few more touch screens, and none will do better than Voyager. People I think will be soured by VZW offerings. There will be hype surrounding it, but it will not be anywhere as successful as the Apple iPhone 3G or BlackBerry Bold. Are you really comparing the Voyager to a touchscreen by Blackberry? lol. um actually it did sell quite well, the demand for the device was greater than the supply for several months after the holiday season. The same for the iphone. All this buzz around it then it failed to really impress the masses. I've heard just as many complaints about the iphone as I have the razr. I even prefer the voyager, even the glyde to the iphone. the only at&t phone to really impress me was the 8525. Nope. I never compared it at all. I'm just saying that the average person is soured by the VZW lineup as evidence by the Voyager. Voyager quickly became a forgettable device shortly after release. I wasn't comparing the two per-se, just that people dont care about VZW touch screen devices. And the general consumer is not going to get overly excited of a new touch screen just because it says BlackBerry. The two are uncomparable whether it be as a touch screen "per-se" or "memorable device". The facts are this: Blackberry devices are the highest selling and most used handset in the history of wireless (regardless of the carrier). Now with the integration of media sync (ability to use the Thunder with iTunes) flickR and youmail (visual voicemail for Blackberries), the Thunder will without the shadow of a doubt give the 3g iPhone a run for its money. Think about it, the Thunder will have MMS, a basic service the iPhone still has yet to incorporate in it's device (surely for marketing advantage to buy apps later on), full html browser and in a lot of cases free software to enhance it's already robust features not to mention EVDO RevA with soon LTE on a network proven to be the best (this is from a consumer perspective I have been with att vzw Sprint and TMobile)... It says blackberry on it and YES that will turn heads. You are right, VZW touch screens have not been stellar (though sales numbers say otherwise) but Blackberry has never disappointed. If it has it has always been quick to release software to fix that or a new operating system to meet customer/media needs. The average person is not soured, they wouldnt have as many customers wanting devices such as the Voyager Glyde the upcoming dare or even the thunder if that was in fact true. VZW would be a dying company like sprint if the "average person" were truly soured. We appreciate the personal opinion and I hate to cloud the issue with facts, but let's just wait and see what happens. I am not amused. Its hard to look excitedly at this phone with the fact that I have seen the Thunder. Yeah Touchscreen blackberry goodness makes this phone look like the Fischer Price "My first Blackberry" Agreed if this came out and we had never seen the Thunder it would be massively impressive But VZW is not stupid theyre just greedy So becuase they knew the Bold was going to ATT and hype was building they had to crush them with "leaked pics" because now who really wants the bold? hmm, hmm, i mean besides the business people who wont even see these for years unless tey buy thier own Companies are just now ramping up 8830's The THUNDER will crush the iphone, blackberries are better devices all around And as someone said THE MOST SOLD DEVICE WORLDWIDE now i may disagree becuase i think rim sold like 4 million BB's last year and 5 million iphones were sold But blackberries are notoriously stable, secure and now FUN. VZW your day is dawning, if you dont eff this up and wait till 2009 to release it. F the tesing, its a blackberry just get it in consumers hands. RIM will handle up on issues if they arise I will be buying the THUNDER on contract when it comes out....If i dont have to wait till im 35 before it comes out And as C-Chickie said... I am not amused. Its hard to look excitedly at this phone with the fact that I have seen the Thunder. Has anybody been able to get a release date on this phone yet? I have asked a few of my superiors and they don't even know. I love Blackberry and cant wait to get this one for my demo line.